A family of pocket-sized and low-cost optical power meters for the installation and maintenance of singlemode and multimode fiber optic networks. 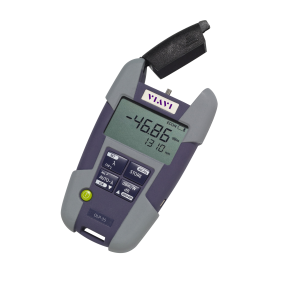 VIAVI SmartPocket Optical Power Meters (OLP-34, OLP-35, and OLP-38) offer an excellent price/performance ratio in a rugged and pocket-sized housing for straightforward use in the field. Mainly used to measure optical power level (dBm) in premises, telco, or CATV fiber optic networks, they also can be combined with LED (OLS-34/OLS-36) or laser light sources (OLS-35/OLS-36) for insertion loss measurement.